What do you do if you have a bowlful of ripe peaches? Of course, you make Upside Down Peach Rum Cake. Dark rum and peaches are a wonderful combination, and add a depth of flavor to the peaches I actually got the idea from Lindsey@Gingerbread Bagels to add the dark rum to the peaches. I haven't baked anything lately except cupcakes in awhile, so It was time to fire up the oven. It has cooled off here, thank goodness. 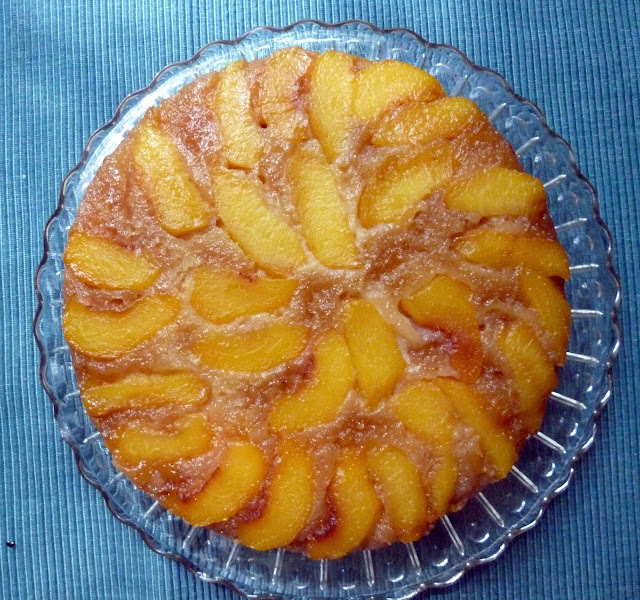 This cake is so moist with the caramelized peaches and rum on the top, or is it on the bottom? Anyway it is delicious. Preheat an oven to 350 degrees F (175 degrees C). Whisk the flour and baking powder together in a small bowl; set aside. Butter a 9” cake pan. Stir the brown sugar, 1/4 cup melted butter, and dark rum in a 9-inch cake pan until the sugar has dissolved. Arrange the peach slices in the pan. Set aside. Beat 1/2 cup butter and the white sugar with an electric mixer in a large bowl until light and fluffy. Beat in the first egg until incorporated, and then beat in the second egg. Pour in the flour mixture alternately with the milk, mixing until just incorporated. Gently pour the batter over the peaches. Just the name caught my attention,but now that I have seen the picture I know this cake has some awesome flavor. Simply delicious! Tina-Thank you for your sweet comments. Becky you did amazing job..this is not only beautiful looking but tasty too! Have a wonderful weekend! Christine-Take a piece, if you like. It is good. Kelly-Thank you for your sweet words. Sandra-Thank you for wonderful comments. I certainly appreciate them. Oh, my yummy goodness! I need to do more than the usual pineapple upside down cake...this sounds delicious! Kate-This is a different wist on the pineapple upside down cake, but really good, especially with the rum. Oh, I've made something similar, but rum would have made it even better! Thanks, Becky!!! Looks wonderful and I love the addition of rum! This is what I should have made with my peaches since they all ended up on the bottom of my pound cake anyway! Ah yes! What a great way to use summer's fruit. I love upside down cakes, and now I just have to try making a peach variety. Thanks for sharing another delicious recipe with me. I'm eating a very late lunch and enjoying your post. I hope you have a great week...stay cool! Upside down peach rum cake? My future daughterinlaw just asked for this for her birthday today! I cant wait to make this for her belated since I had to work all day thank you so much! I love summer fruit, and upside down cake is a good way to showcase the yummy fruit. We are lucky that we have cooled off, and it's gorgeous now. Hope you cool off soon. This is a quick cake to make. The longest part is slicing the peaches. Enjoy! Beautiful!!! Love the addition of rum!